This five-day workshop will allow you to explore a personal response to aspects of the natural or built environment, experimenting with the many possibilities from the pictorial to the abstract. It is suitable for those of you who would welcome a concentrated period of time to develop your technical painting skills, generate new ideas and benefit from creative, like-minded company. A variety of media will be used including oil paint, acrylic, mixed media and collage. 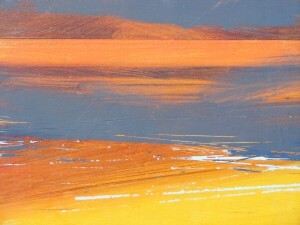 Tutor Bob McGilvray was until recently a lecturer in Fine Art at Duncan of Jordanstone College of Art, University of Dundee and has exhibited throughout Great Britain and in Ireland and Europe. He is also a consultant and author on Public Art and Design and has lectured at conferences throughout Britain, Northern Ireland, Scandinavia and the USA. His painting practice is concerned with memory and response, with particular reference to the differing light, colour, climate and atmosphere of both the East and West coasts of Scotland. The choice of location or locations for source material can be in the natural or the built environment and may be as general or particular as you desire. A location might be a particular place or a visual experience remembered. For example, it may be a panorama of sky and landscape, a detail of natural form or a scrap of peeling paint on a door. It may also be about the weather or the changing light over a period of time in a particular place. While the immediate landscape and buildings at Ladybank provide a wealth of material, you may already have drawings, photographs or even objects from a previously explored location that you wish to further develop. Whatever you begin with, the workshop will endeavour to explore many exciting possibilities which will enable you to develop your personal voice. The course will start with an introduction (or refresh) of methods and materials. There will also be an overview of the work of relevant artists. Thereafter, you will spend some time gathering source material together, developing ideas and producing a finished piece of work. The course will finish with a group exhibition, critique and maybe some liquid refreshment! Everyone will leave with a strong sense of next steps for their work. Cost £220, including use of some materials. Places are limited to ensure high levels of personal tuition.